"As He passed by, he saw a man blind from his birth. And his disciples asked him, "Rabbi, who sinned, this man or his parents, that he was born blind?" Jesus answered, "It was not that this man sinned, or his parents, but that the works of God might be made manifest in him." Yes, God can heal people, and there are indeed people who have the charismatic gift of healing. But there are also people who are born to suffer, for the good of others. So when a preacher says that if you give him money, then God will heal you as a result, don't believe him. 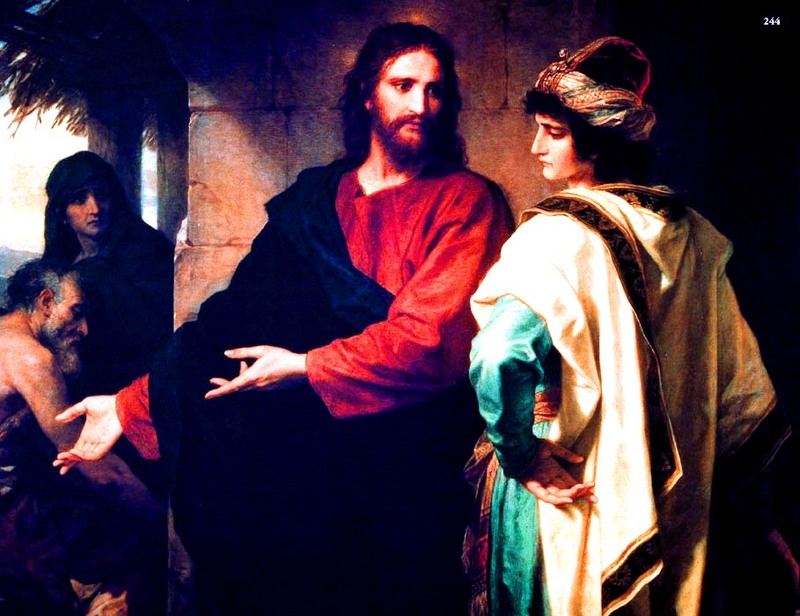 The Centurion didn't give Jesus money in order for his servant to be healed. Rather, it was his faith, not his purse, that cured the servant (Matthew 8:13). Some TV preachers even go so far as to say something like this: If this broadcast has been a blessing to you, then please send me some money". Selling blessings is what started the whole protestant reformation, as Luther accused the entire Catholic Church of selling the blessing known as an indulgence (this practice was only in Luther's diocese of Mainz, not the entire world). Selling blessings is the sin of simony and is condemned in the Bible in Acts 8. So why do so many gullible people believe just the opposite, preach just the opposite, and give money to these TV preachers? They are either ignorant of what Jesus actually taught, or they want to believe the TV preachers because of their looks, their personality, and their gift of oratory. Many of these TV preachers are multi-millionaires, and live in gated communities with the rich and famous. You have to ask yourself these questions - "Is that how Jesus lived?" "Is that how the apostles lived after Jesus died?" "Is being a multimillionaire in line with what Jesus preached?" Let's take a look at those questions. Well, Jesus said in Matthew 8:20 that "the Son of Man has no place to lay His head". That pretty much says that Jesus did not live in a fancy house. In Acts 10:32, we learn that Peter was lodging with a tanner beside the sea. Tanners were definitely not rich people, and Peter did not own the house. Jesus said in Matthew 19:24 that it will be easier for a camel to go through the eye of a needle than for a rich man to get into heaven. Jesus said in Matthew 16:24 to deny yourself and take up your cross and follow him. Follow him where? To Calvary, which is a place of suffering, not a rich gated community. So is all lost for the rich? Not totally, but the problem lies with the faith that rich people put in their money, rather than in God. In Matthew 27:57, we learn that Joseph of Arimathea was a rich man, but who was also a disciple of Jesus. Joseph of Arimathea took the body of Jesus and laid it in his own personal tomb. We don't know what Joseph did after this, but it is safe to assume that he followed the teachings of Jesus. Today, if one is observant, he or she will look at Mother Teresa of Calcutta as an example. She lived in poverty all of her life, and refused to have expensive dinners held in her honor, preferring instead to have that money given to the poor. The St. Vincent de Paul Society regularly donates time and money to the poor. The thought process is that the reward for these efforts comes in the next life, not in this one. And that is completely in line with the gospel message. Matthew 5:12: Rejoice and be glad, for your reward is great in heaven, for so men persecuted the prophets who were before you. Luke 6:35: But love your enemies, and do good, and lend, expecting nothing in return; and your reward will be great, and you will be sons of the Most High; for he is kind to the ungrateful and the selfish. Many non-Catholics will accuse the Pope of living in the lap of luxury, but that is totally false. The Pope's apartment in the Vatican is very spartan. Most people in America live in nicer quarters than the Pope's apartment. Yes, it is attached to a huge Church and Art museum, but the Vatican is a country after all. Matthew 16: 24:Then Jesus told his disciples, "If any man would come after me, let him deny himself and take up his cross and follow me." Taking up your cross is a euphemism for self denial. Following Jesus with His cross means going to Calvary for self-sacrifice, not to a rich gated community. This one statement of Jesus runs directly counter to the message of the rich "televangelists" who preach the gospel of earthly prosperity. We all have to be careful about wanting to win the lottery or to get rich. 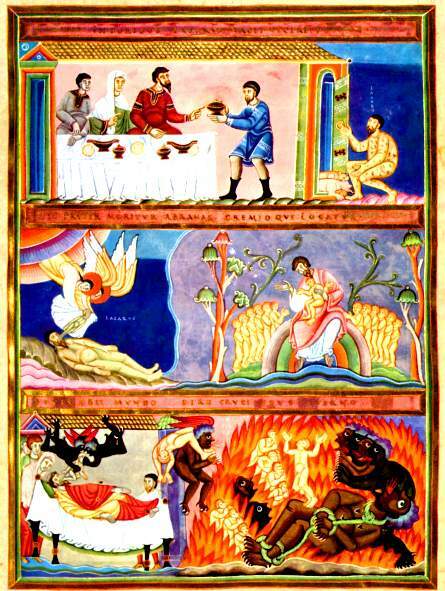 In Luke 16, we learn about the fate of the rich man who only gave Lazarus his table scraps. It did not end well for the rich man, who was definitely blessed in this life, but was certainly not blessed in the next life. Our goal as Catholics should be to serve the poor in this life (Matthew 25:31-46), and to be blessed in the next life, which lasts forever. So many people today try to live out the total opposite message of the gospel, which warns about the dangers of being rich. James 5:1-6: Come now, you rich, weep and howl for the miseries that are coming upon you. Your gold and silver have rusted, and their rust will be evidence against you and will eat your flesh like fire. You have laid up treasure for the last days. Behold, the wages of the laborers who mowed your fields, which you kept back by fraud, cry out; and the cries of the harvesters have reached the ears of the Lord of hosts. You have lived on the earth in luxury and in pleasure; you have fattened your hearts in a day of slaughter. You have condemned, you have killed the righteous man; he does not resist you. Your riches have rotted and your garments are moth-eaten. I feel a divine jealousy for you, for I betrothed you to Christ to present you as a pure bride to her one husband. But I am afraid that as the serpent deceived Eve by his cunning, your thoughts will be led astray from a sincere and pure devotion to Christ. For if some one comes and preaches another Jesus than the one we preached, or if you receive a different spirit from the one you received, or if you accept a different gospel from the one you accepted, you submit to it readily enough. Not everyone is called to live in total poverty (to be "perfect" in the words of Jesus), but that isn't the question. The question is more like, "are you a miser, do you aspire to be rich, or are you charitable towards the poor?" Choose wisely!